On this page you can listen to the sounds of african animals online. 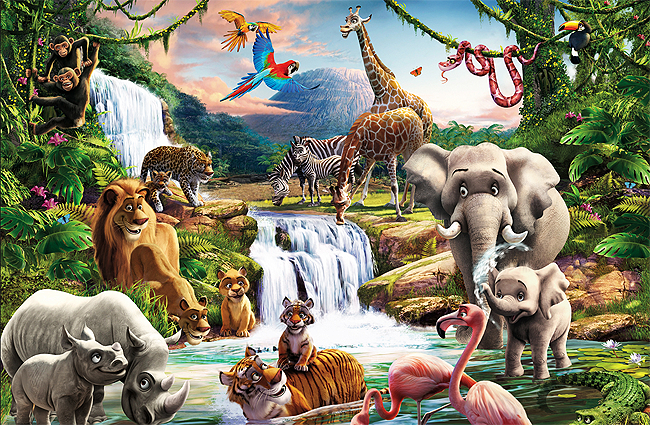 Just above you can see a beautiful picture with the exotic animals in the jungles. Just click on any of them and listen to the recording of how they sound. If you want to stop playing, simply click one more time on the animal. Volume can be adjusted in the upper right corner of the application. Monkeys (hanging on the tree). Sound: «Ook hoo hoo hoo hoo». What they do: gibber. Adult rhinoceros. Sound: «Huuuuuuuuuugh». What it does: growls, bellows. Baby rhino. Sound: «Oom... Oom... Oom». What it does: squeaks, grunts. Lion. Sound: «Arrrrrrr... Roarrrrrrr!». What it does: roars, growls. Lioness. Sound: «Arrrrrrr...». What it does: roars. Lion cub. Sound: «Awwwrh! Awrh! Aw!». What it does: clumsily roars, squeals. Leopard. Sound: «Rrrrrrr... Rhrhrrr». What it does: roars. Leopard cub. Sound:«Meowrrr!». What it does: roars, meows. Yellow parakeet. Sound: «Chirrup! Chirrup!». What it does: squawks. Mulga parrot. Sound: «Chirp! Chirp!». What it does: squawks, screeches. Zebras. Sound: «Weehe!». What they do: neigh, whinny. Giraffe. Sound: «Aah aah». What it does: snorts, bleats, moans, makes low-frequency noises. Snake. Sound: «Sssssssss... Hisssss...». What it does: hisses, rattles. Toucan. Sound: «Squawk! Squawk!!». What it does: screams. Elephant. Sound: «Baraag!». What it does: trumpets, bellows, growls. Baby Elephant. Sound: «Nrrr!». What it does: trumpets, bellows. Crocodile. Sound: «Ghrrrrrrr.». What it does: growls, bellows, lowly roars. Flamingo. Sound: «Gaggle! Gaggle!». What it does: clucks, quacks. Tiger. Sound: «Rrrrrraaa... Agrrrrrr». What it does: roars, growls. Tiger cub. Sound: «Rrraw!». What it does: tries to roar, meows.